with our counterparts from the Poland office. I spoke with a number of interns who all impressed me in various ways. Not only did I have the opportunity to meet an intern who spent the previous summer working for the United Nations in Geneva, but I also met an intern who has interned with Google three times since her first year in college. There was also the Googler I met who spoke five languages fluently. Speaking of impressive people, the Dublin office welcomed five U.S. interns as part of a week-long OMAP - BOLD exchange program. Our U.S. interns were quickly integrated into the Google Dublin culture by visiting the Guinness Brewery, taking a viking tour of the city and working diligently on their five-day project. 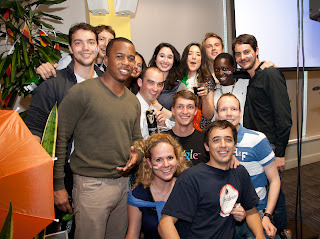 Some of the European and U.S. interns at last week's intern-organized TGIF. On the weekends, fellow interns and I have been exploring Ireland and all it has to offer. During the 10 Days in Dublin festival, Dublin interns and I sat in on comedian Fred Cooke’s “Comfort in Chaos” performance at the International Bar, only a few minutes walk from Grafton Street. It goes without saying that if you can work well with others, you’ve achieved a lot. The real test, however, is seeing if you can laugh with the people you work with. Well, after one night at the International Bar, consider this mission accomplished. The laughs continued as we attempted to hike various “hills” during a day trip to the Wicklow Mountains, less than an hour south of Dublin. Wicklow is known as the Garden of Ireland with its 750 square miles of rolling hills, mountains, glacial lakes and waterfalls. Aside from brushing up against a few prickly plants, we all survived and had a fantastic trip outside of the city. Luckily, the traveling doesn’t stop here. When I applied for an internship with Google, I never thought I’d be flying to Mountain View, Calif. to spend a week working on a project at our global headquarters. It’s amazing that I get to travel to a different continent as part of a 10-12 week internship. I will make sure to keep you updated on the exciting experience ahead. That’s all for now! Talk to you soon! Fun Google Fact: Oftentimes, you hear about companies recruiting with headlines like “Apply here and work with rock stars!” Although Google does not use such a line, you may actually get to work with rock stars. In fact, one of the colleagues on my team used to be the guitarist and bass player of The Thrills, an Irish rock band with #1 debut hits and platinum statuses. As I said before, at Google, you never stop working with impressive people. At Google, you never stop working with impressive people. In an attempt to increase collaboration among our European offices, University Programmes encouraged all Dublin interns to have Google+ Hangouts with our counterparts from the Poland office. I spoke with a number of interns who all impressed me in various ways. Not only did I have the opportunity to meet an intern who spent the previous summer working for the United Nations in Geneva, but I also met an intern who has interned with Google three times since her first year in college. 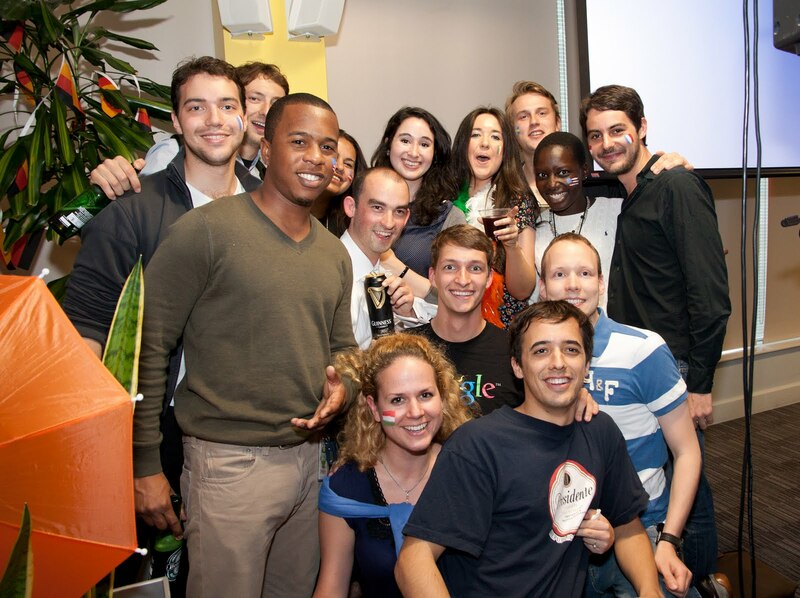 There was also the Googler I met who spoke five languages fluently. Great post! These are seriously so inspiring.